To accomplish this, the Japanese relied on a simple wooden sword called a "bokken" for much of their training. Bokkens: Training Swords It was made from the super tough wood of the Japanese Green Oak tree, a wood they called Kashi. The swords produced from this wood had the advantage of replicating the size, weight and feel of a steel sword, while minimizing the possibility of causing grievous or permanent injury to those who used it. Authentic Kashi wood Bokkens are still used today, but are becoming quite costly. They also have the disadvantages, being made of wood, that they may rot, crack split or splinter. Cold Steel's solution to these dilemmas was to design a synthetic substitute, low in price and impervious to the elements. 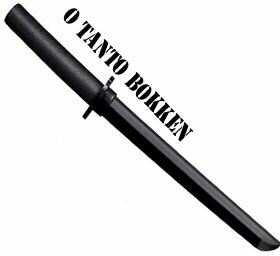 Our Bokken and our new Wakazashi Bokken are made of the heaviest grade polypropylene available and closely duplicate a real Katana and Wakazashi in length, size, weight and feel. While they're not quite as rigid as wood, they have the advantages of being virtually unbreakable and remarkably stiff and cut resistant.